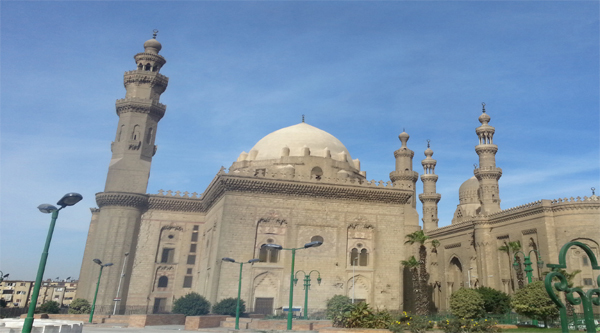 Mosque and Sabil of Sulayman Agha al-Silahdar (N382) – 1839/1255 – is a rare and fine example of a monument dating from Mohammed Ali Pasha reign and is a mixture of indigenous and imported styles. 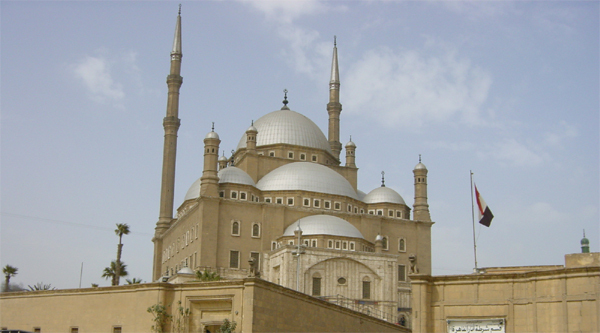 The innovated feature is the sense of movement, derived from European baroque and rococo forms, imported via Istambul to Cairo, which gives the basically Mamluk façade new life. The rhythm of the windows, from upper right to lower left, continuing into the rounded form of the sabil, is the most obvious expression of this new surface plasticity. Other examples are in the upward slanting wooden eaves, the growing plant forms where sabil and mosque meet, the undulating fronds above the windows, and the patterns of the finely cast grilles. The northern end of the façade is set above street-level shops. The overall plan is very interesting. In 2001 a large cistern was discovered under the sabil and its adjacent kuttab. These parts of the ensemble at the southern end of the façade are aligned with the street. The mosques, however, up another level, is not. Its elements, a small forecourt and a prayer hall, are arranged diagonally across the northern part of the building so as to be properly directed towards Mecca. 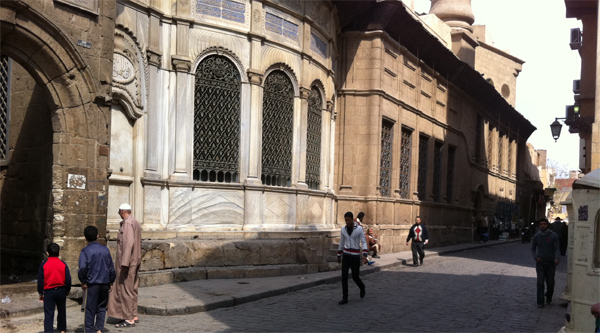 The façade of the sabil, a flamboyant display of late Ottoman decoration, rounded and built of marble with round arched windows, is at the southern part of the complex. Its cast bronze window grills have a very intricate lacy pattern. Above them are marble carvings imitating textile folds, a device of Italian Baroque art. 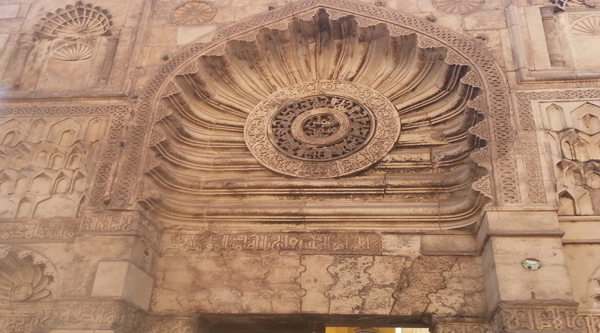 Cartouches with Turkish inscriptions in nasta’liq script decorate the entire upper part of the sabil façade and above there is a repetitive motif of acanthus-like leaves. A wooden carved and painted sunshade tops the sabil façade. Next to the sabil of Sulayman Agha al-Silahdar is a round arch that frames the entrance on the side street leading to another entrance to the mosque through a covered flight of steps. The plan inside is a blend of Ottoman and Cairene styles. 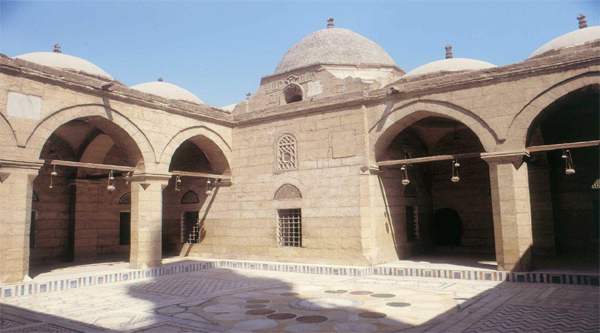 The small forecourt with shallow domed arcades is Ottoman, but the roof with the malaqaf is Mamluk, as is the plan of the sanctuary, which is divided into three aisles by four central columns. Above the entrance to the mosque is a charming small semicircular balcony that is very Western in style. A railed balustrade over the entrance was for the use of Quran readers. The roof of the sanctuary is carried on four identical marble columns, forming three aisles parallel to the qibla wall. They support round arches and a central lantern. The prayer niche, made of white marble, is decorated with Western style floral motifs and looks like something that might be found in European baroque church. The dikka is a gallery with wooden balustrade above the entrance, communicating with the small round balcony outside. A row of horizontally pierced oval windows bring light from the courtyard into the interior. 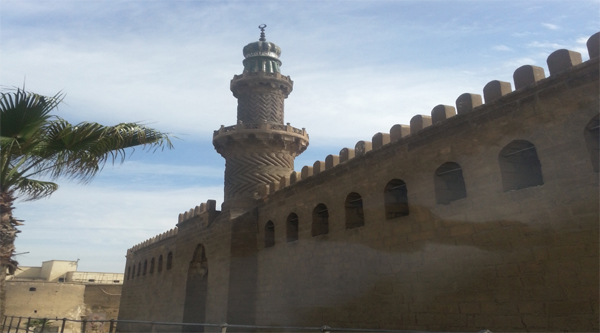 The minaret of the mosque, an especially elegant shaft, tall, slender cylindrical with an elongated conical top, stands between the madrasa and the mosque. It has one balcony on horizontal moldings.